I spend a few hours cleaning my place. From vacuuming to cleaning the tub to windexing the windows and mirrors, these simple tasks really make me feel good in my space and I appreciate the look of it. I don't go crazy and rearrange the entire aparment - stability is a good thing. (Just ask Boy. He likes to keep the place as is) But if you have been wanting to make a change in your space and you are feeling a bit antsy in your small space - go for it! 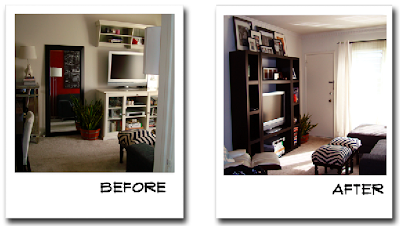 I had been wanting to get simple Ikea bookcases for our TV unit for a long time. I like the clean lines and the height. I finally went for it and am really happy! The new TV unit I made is still a little work in progress but my space feels bigger and fresh to me. I have a some framed art work throughout my place and I like to move them around from time time to time. The Jazz art gallery has found a new home in our bathroom. And our leaning mirror is now hanging above our mirrored buffet. 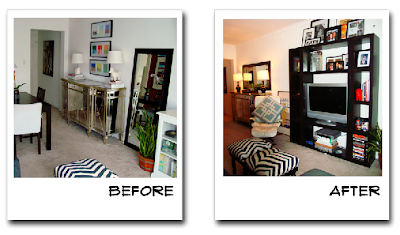 By reusing our own things, our place feels new, bigger and it didn't cost a penny. I love buying flowers for my space. Inexpensive and colorful, these little guys make me smile. Also, if you happen to see some pretty branches or leaves on a walk, bring them home with you and create a nice centerpiece for your table or add a natural element to a vase on your bedside table. I love flipping through design magazines, catalogues and fashion guides. The colors + designs + artists are super inspiring and can offer great tips on anything and everything home related. Whenever I feel like I want to get bigger, I simply look through these guides to find ideas for my small space and it gives me a renewed energy and interest in my home.